While I’m sure this post is boring to most of our land friends, I hope it’s interesting and/or helpful to sailors preparing to cruise. First and foremost, I must give props to the previous owners for doing some outstanding upgrades to the boat, leaving us very little to worry about before we sail off permanently. But as with any new home you buy, there are always some things you need or want to make it your own. This is a list of the things we decided were essential to have on board for our life aquatic (in order of priority). New running rigging. All lines aboard were worn when we bought the boat. We learned the hard way on our previous boat that they will break when you least expect it, so we replaced every single one. This gave us the opportunity to color code all the lines with our own color scheme. Mast and rigging check and straightening. On the delivery voyage to New Orleans, the main sail got stuck in the furling several times. This required our fearless Captain to climb the mast to free the sail. After some research, we discovered that our boat had some mast bend that was partially the culprit. Furling masts need to be as straight as possible to prevent sail bunching when furling and unfurling. Large DC Television. I know this is probably not in the right priority and many old salts will scoff at a TV on board, but we wanted to make the boat home and a TV in the stateroom was a part of it. We got rid of a 19” 120v AC TV in the main salon and opted for a 32” 12v DC in the stateroom. We chose the Jensen model JE3212LEDWM. It has excellent HD picture, works great with our SeaWatch antenna, and we don’t have to bother running the inverter. New main sail. The other likely culprit of the sticking main was the sail itself. Our current main is a little baggy from wear and adds to the bunching and sticking problem. It is serviceable enough that we will keep it as a back-up main. 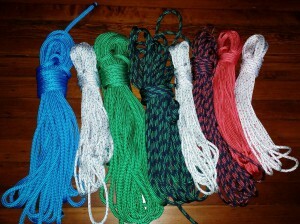 We ordered a new main from Mack Sails. After consulting several sail makers, I felt that Mack had the most experience with IP420s and understood the furling issue and the cut needed to prevent problems. EPIRB registration. This is something we did not even think about until the previous owner forwarded a re-registration notice from NOAA to us. Click here for NOAA Beacon Registration site. Seawater intake to galley sink. For long-term cruising, we felt this was a necessity to save water. We used the existing through-hull for the A/C intake and added an inline filter and Y-valve to the hose leading to the existing manual pump faucet at the sink. This now allows us to switch between fresh water from the tank and seawater for the manual faucet while we have fresh water only for the pressurized sink faucet. 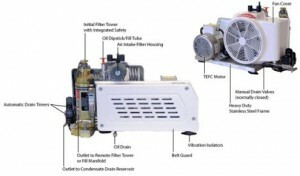 SCUBA Compressor. We love diving and want to do it in remote locations, so a compressor to fill our tanks is a necessity. We looked at three models and decided on the Brownies YP-25. The deciding factor was the “soft start” feature which will allow us to power the compressor with our existing 4KW diesel generator. All other models required way too much amperage at startup (up to 85 amps). We could have gone with a gasoline or diesel model, but we really did not want another motor to maintain or the hassle/safety issue of filling gas tanks aboard. Chartplotter. We purchased the boat with two networked Garmin chartplotters. Unfortunately, they use the old style Garmin proprietary chip to update data. Garmin customer service was less than helpful and their recommendation was simply to buy a new chartplotter. So we did! But not a Garmin. 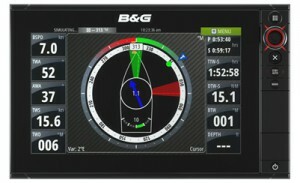 We chose the B&G Zeus2, which is made specifically for sailing and can plug and play into our existing network. It can even control our autopilot. Whisker Pole. We do not have, nor plan to have, a spinnaker, so we wanted the ability to manage our genoa better in rolling seas. We chose the Forespar LC13-24 mounted on a mast track. Life Raft. This item is low on the priority list, not because it is not important, but because we want to wait until the last minute to get it to maximize our certification time. We will wait until we are ready to depart coastal areas next year to buy one. We have not yet decided on what model to get.